To those who say rock ‘n’ roll is dead, I offer Phat Headz, where both local and national bands are proving that rock is very much alive. This Green Bay music haven is hidden in a nondescript tavern at 420 N. Clay Street. While the exterior may not look like much, once you open the door to Phat Headz you’re filled with a rush of heart-pounding live music. With a stage centered close to the bar, it’s easy to find a clear view of the dynamic selection of bands. 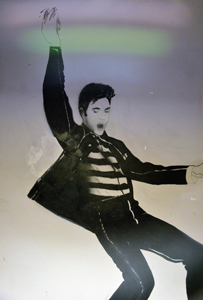 Phat Headz’ décor features detailed murals of rock, punk, and jazz icons. 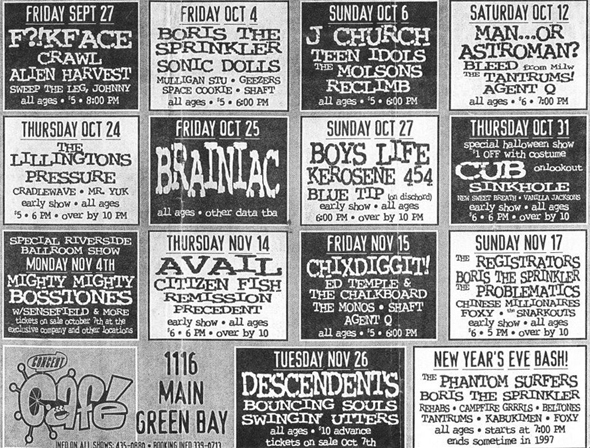 It beckons to the days when Green Bay had a vibrant rock and punk scene headed by establishments like Lefty’s, Duck Duck Goose, Speakeasy, and the Concert Café. Before I jump into what Phat Headz has to offer, let’s take a look back at these iconic venues. Lefty’s made its mark in the late 70’s and 80’s hosting bands like the Violent Femmes, Soul Asylum, and Spooner (Butch Vig’s band prior to producing Nirvana’s “Nevermind” and forming Garbage). Lefty’s was also home to Pub Theatre, in which UWGB theater and faculty put on performances at the bar. Today, all that is remains of Lefty’s is a wooden sign which hangs at Billy Goats Pub on S. Broadway. Duck Duck Goose (which is now Phat Headz) was right down the street from Lefty’s and has a rich history as part of Green Bay’s music scene. During the 80’s, Greg De Tennis started a locally produced cable TV program at Duck Duck Goose called “Video Wave.” It featured videos of alternative/new wave rockers like The Smiths, Talking Heads, and Echo & The Bunnymen. Segments of the show were shot at Lefty’s, including interviews with acts like the Femmes, Fetchin’ Bones, and The Suburbs. Now if you were a regular at either Lefty’s or Duck Duck Goose, chances are you ended up at Speakeasy. With cold beer and a punk rock vibe, Speaks was not only a great place for a game of pool, it was also home to the greatest jukebox in the city’s history. From Social Distortion to The Ramones, and mixes of carefully selected tracks, Speakeasy was a gathering place for those who took the rock ‘n’ roll lifestyle to heart. It pains me to write about the Concert Café (later known as Rock ‘n’ High School). From what I can remember about this iconic venue, it was a place for the youth of Green Bay to smoke cigarettes and earn their rock chops. While the Concert Café also hosted 21 and over shows, it was really a gathering place for those who were passionate about music. From the Descendents to Nada Surf and NOFX, anyone and everyone played the Café. While ticket stubs and concerts bills serve as reminders of this lost venue, let’s not forget those trying to keep Green Bay’s underground music scene alive. The musical DNA of these former Green Bay music meccas is intertwined with Phat Headz. Look no further than Phat Headz’ recent two-night tribute to Lefty’s. This raging event featured nearly a dozen bands, including the unofficial house band of Lefty’s, Fun w/ Atoms. I attended the first night and was impressed with the eclectic mix of performers. Packed with regulars, rockers, and Leftovers (a nickname for Lefty’s die-hards), Phat Headz showed why it’s a go-to stop for live music in Green Bay. 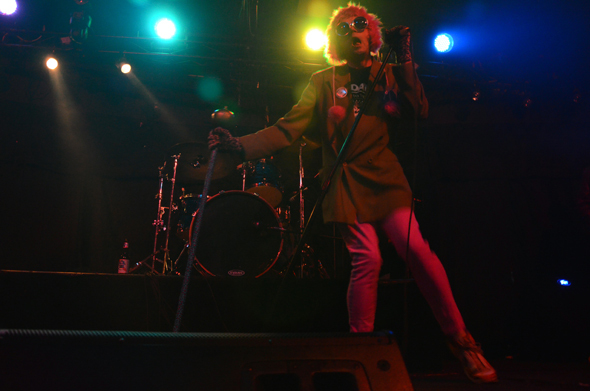 Phat Headz has proven this time and time again by bringing hard-driving rock acts to the area. Alive recording artists James Leg of the Black Diamond Heavies and Left Lane Cruiser are just two examples of that. Beyond national musicians, Phat Headz is also a playground for local bands, including Rev. Norb and The Onions, Corey Wayne, Midwest Beat, Holly and the Nice Lions, and Beach Patrol. So if you’re looking to rock on, make sure to check Phat Headz’ event calendar online. You can also stop in at The Exclusive Company (423 Dousman St.) to get the lowdown from promoter Time Bomb Tom Smith. Thanks for the memories, and for knowing this stuff and writing about it! I lived in GB in the late 70’s. It was a great time. There was a special breed of people there at the time who had been attracted by the new UW campus. Idealists, and certainly into music, and food. I was a manager at the N.E.W. Whole Foods co-op which was in the same building with Lefty’s. In fact we owned the building at the time, and Lefty’s was our tennant. I left in about 1980 and lost track of everything in GB. Thanks for filling in some blanks! Gary you’re so right…that “scene” back in the mid to late 70’s was amazing…I was best friends with Joe Miszkewiscz (pronounced miskavich) whose parents bought the old “Tropics” in 1977…for about 3 years (before it was turned over to stripping) the Bamboo Room ROCKED!! Bands like Bad Boy, Sun Blind Lion, Ruby Starr (female singer in Black Oak Arkansas) and Yipes (w/Pat McCurdy) to name a just a few, headline a list of the AWESOME bands that played the venues like Lefties, Snuggy O’Briens (now Phat Headz) and of course the Bamboo Room…Things changed in the early 80’s and have never been the same but the new influx of music to the now Phat Headz has certainly resurrected some of these old memories of what I believe was about as good a 4-5 year span of live music as it ever got in Green Bay. Thank goodness that somethings never change. Do you still live there? Do you have the sense that music and the music scene of late is better than it was, like ~10, 20 years ago? Gary – Thanks for adding to the story. N.E.W. Whole Foods co-op sounds like a place that would fit into Green Bay today. There is actually an organized effort for a new co-op called the New Leaf Market. I’m glad you enjoyed the read. OMG! I was at Phat Heads over the weekend and saw Stone Crow. Awesome band!! Wasn’t sure what to expect of Phat Heads but once in side it was filled with music lovers enjoying a great road band. The murals painted on the walls are amazing. The artists is really talented. I’ll definitely go back! !